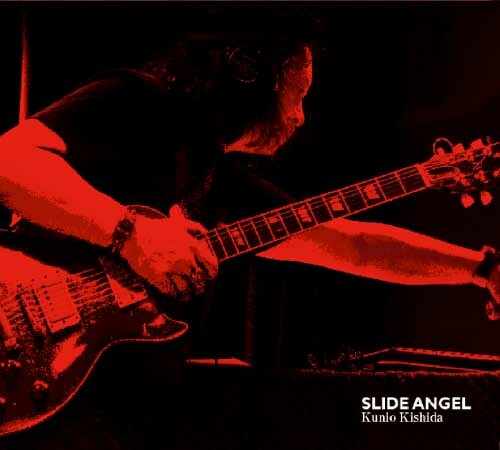 In Association with Japanese Player Corp. .
Kunio Kishida Goes Back to His Roots with His 8th Album "Slide Angel"
I just received the new album by Kunio Kishida. 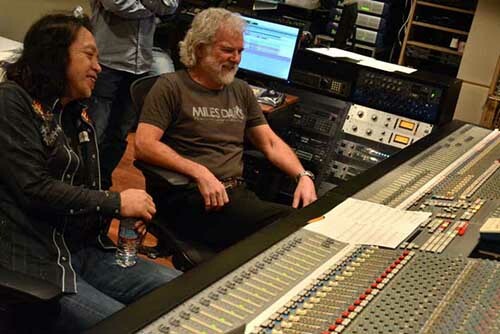 It's called "Slide Angel" and it takes Kishida back to his roots while featuring a solid collaboration with Chuck Leavell, the man also known as the keyboard player for the Rolling Stones. 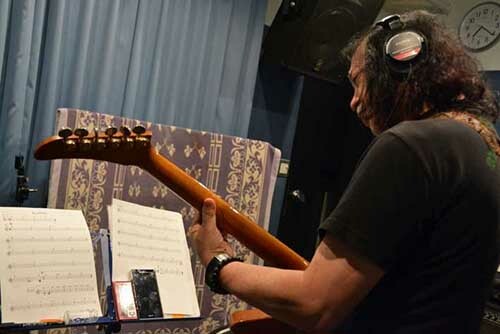 Here is a behind-the-recording story from Kishida, with details on his songs as well as his guitars. 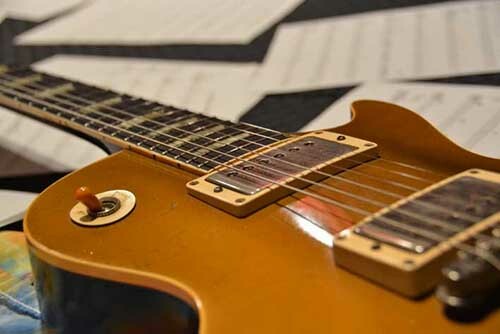 Vintage Les Pauls used in the recording sessions. 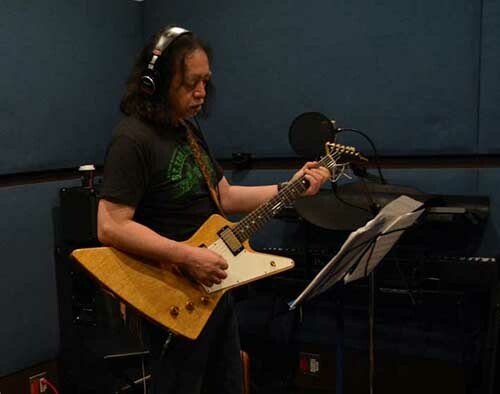 Kishida had been playing music semi-professionally ever since he was a teenager at school. During the 1970s to the '80s he worked for a major musical instrument company and pioneered the Japanese market for vintage guitars. Kishida later opened his own guitar shop, Nancy, which focused on vintage guitars. In the '90s, he became very active performing live as a guitarist himself, and in 2002 released his first album "Swamp Waters." 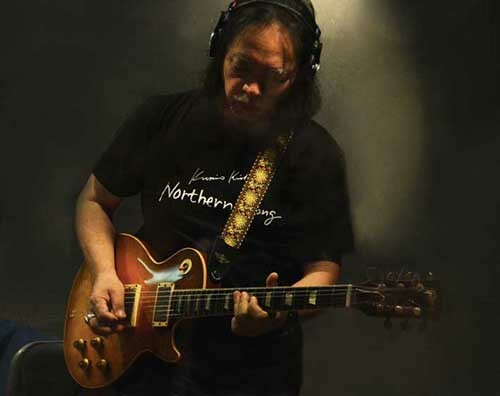 As a player, Kishida focuses on southern and blues rock and has a reputation of being a guitarist who gets the best sounds out of vintage guitars, which are now a rarity among instruments. ■ Chuck was putting his spirit into it. It was like he was doing combat with the Hammond! Q: It's been a year since your last album "Northern Song." Tell us what you’d been up to since then. Kunio Kishida (KK): Well, my new album started from one email. 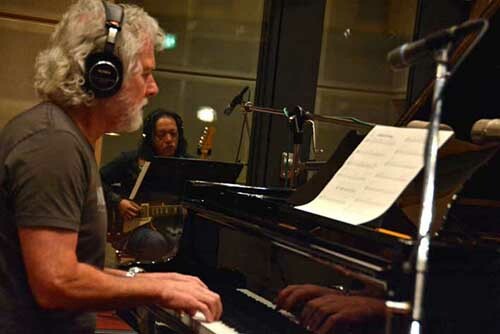 I wrote to Chuck Leavell, who plays keyboards for the Rolling Stones, and said, "Let's party and stuff again. If it's okay with you we can maybe do a recording together," especially because in the last Stones tour to Japan (2014) they weren't doing so many concerts compared to how long they were staying here. Then things snowballed into a recording session with Chuck on March 5th, and in less than a month we made nine songs! The session was held in Ginza at a studio called Onkio Haus, and March 5th happened to be the only date available there. So we booked the studio and went in. 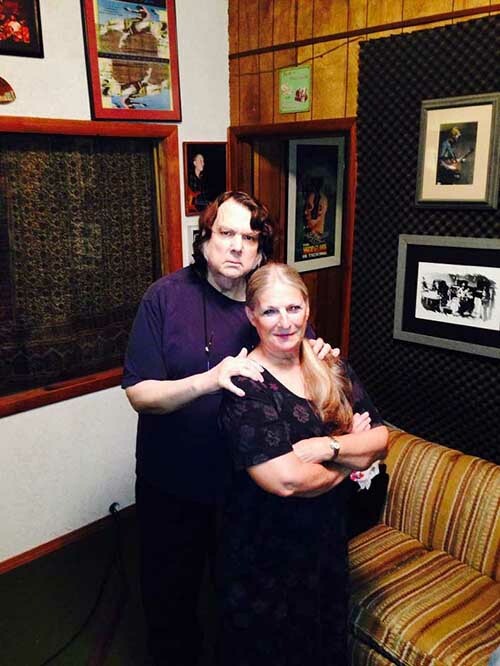 Since time was limited, there were songs me and Chuck did together as well as songs that Chuck recorded alone beforehand, and we finally recorded six songs just on that day alone. 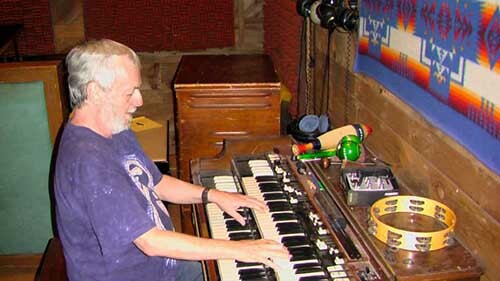 Going up the stairs at the studio on the day of the recording, Chuck spotted a Hammond B3 organ and said, "Hey, can you bring me that B3?!" When using a B3, you place the Leslie speaker in another room and so the player can voice. During the recording, Chuck shouted out like "Huh!" or "Whoa!" putting his spirit into it. It was like he was doing combat with the Hammond! Everyone in the room including the crew was having goose bumps. It wasn't "work mode" at all! I’m glad we had that energy when we started making this album. 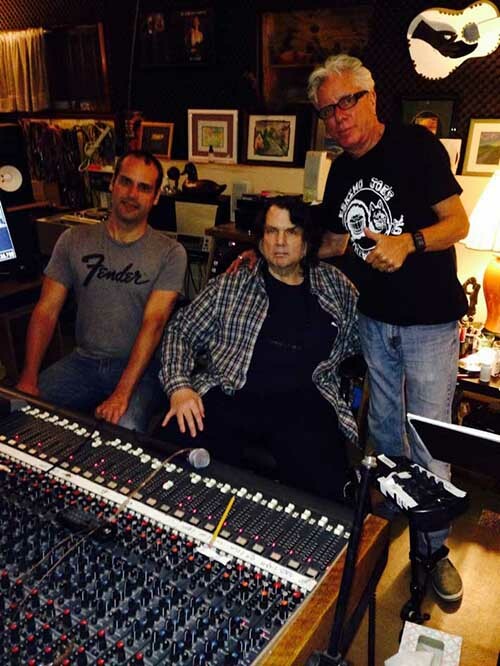 Since then we were able to carry on that energy through my guitars we recorded with and the drums and bass my friends recorded in America, and producer Johnny Sandlin also carried on that energy too. Q: Chuck truly excels both in organ and in piano, doesn’t he? 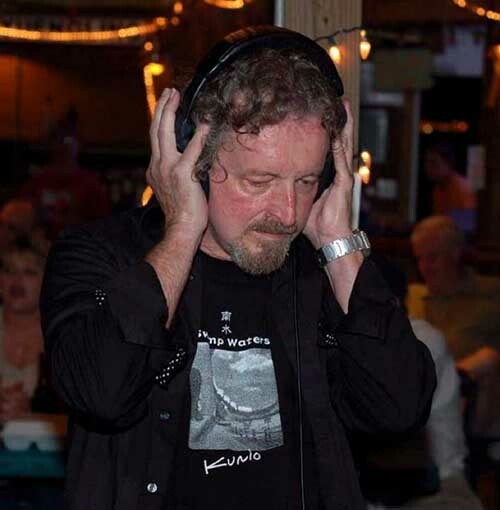 KK: Chuck had also joined us on my past album "Alabama Boy," but there were lots of guys older than him on that album, so he focused on trying to keep it organized. But on this new album, the minute he found out that the band had fewer members, he was like "Okay, then I'm gonna do it all!" Even when we all went out for a meal together before the recording, he said, "We're all past sixty, and I now just wanna place my priorities on playing with friends," even though he knew I can't pay him much! Q: How did you record each instrument? 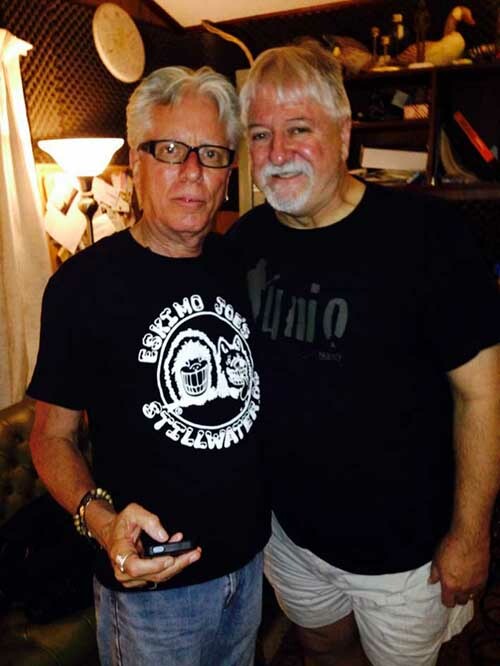 we were laying down bass (Jerry Wasley jr) and drums(Jamie Oldaker) in usa. Actually, (the co-producer) Johnny was ill and was going in and out the hospital. When we finished mixing everything in April I had thought "thank goodness," and we went as far as mastering it. But then Johnny heard it over again afterwards and said that there's something he doesn't like about it. So we re-did some songs, and the album was finally completed in May. It was released in the United States in June. 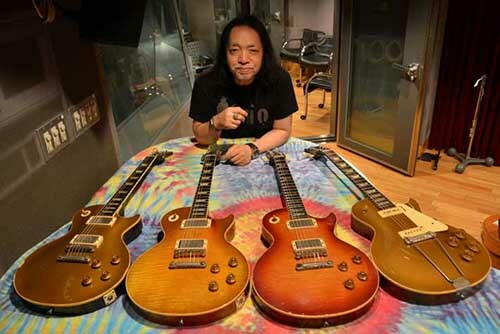 ■ The sound of blues rock, I have to say, is the Les Paul. Q: You've recorded a lot of rock'n'roll for this album. KK: My previous album was more of a requiem, so this time I decided to go back to my roots and focus on blues rock. And I also threw in some southern rock and swamp rock. The sound of blues rock, I have to say, is the Les Paul. So I only used Gibson for the guitar parts. And I tried to record the best sound of each guitar as much as I could. At the same time I used as many guitars as I could in terms as variety, such as Goldtop, Sunburst and LP Junior. I borrowed an original Explorer, too, and it really gave a nice dry American rock sound. Q: You hadn’t used any Fenders that time? KK: Actually, I was thinking of using a '57 Strat on the last song of the album. But when I tried to play it during rehearsal, the sound wasn't coming out even though I had checked it in advance. And then when I brought it back home, it played! Q: I guess it means that if you're going to stick to the Gibsons, you shouldn't play any Fenders at all. KK: Yes, and so I set my mind on using just Gibsons, with the exception of my signature model which is an RS. ■ The '58 Explorer that Clapton owned has sounds only that guitar has. It has a universe of its own. Q: You're already using a lot of guitars, depending on the sound, on the very first song "Blue Bonnet." KK: Since it's the first song I decided to use a lot of guitars, which are the Les Paul Jr. that Duane Allman used to use, my '59 Les Paul nicknamed "Nancy," and the borrowed Explorer that Clapton used to use. I wanted to let them have a guitar battle at the very beginning of the album. I played the melody line at the beginning with Duane Allman's Les Paul Jr., and the slide fills with the Nancy. The last part is Clapton's Explorer, in a kind of an "E.C. was here." feel. Anyway, when you're dealing with guitars as precious as these, you can't record everything in the States. They can't be carried around so easily. But thanks to modern technology, I was able to record them in Japan and send the data to the States to make this gorgeous guitar battle happen. I think this really means something. GIBSON 1959 Les Paul Standard Sunburst (NANCY), the main guitar of the album and Kishida's best partner in which he has been playing for the past 26 years. The guitar is known for its trebley sound unique to Bursts, as well as its gentleness. It has been played so much that the frets were exchanged two times. The guitar has a double white PAF set, flame top and Grover tuners. Q: Could you tell us the differences between each guitar? KK: Let's start with the Junior then. This one has a P-90 pickup and a mahogany body, so its sound is lighter compared to that of an ordinary Les Paul. At the same time it features a great mid-range and a thick sound, so it's fit for melody lines. The thick sound of the slide part that follows is really the beauty of the '59 Les Paul. The Explorer features a much more sensitive sound for the way it looks. It's a kind of a dry crusty sound. When you play rhythm parts with it, you'll know how great the low sounds are. It's kind of like the Telecaster but with a slightly different outcome. 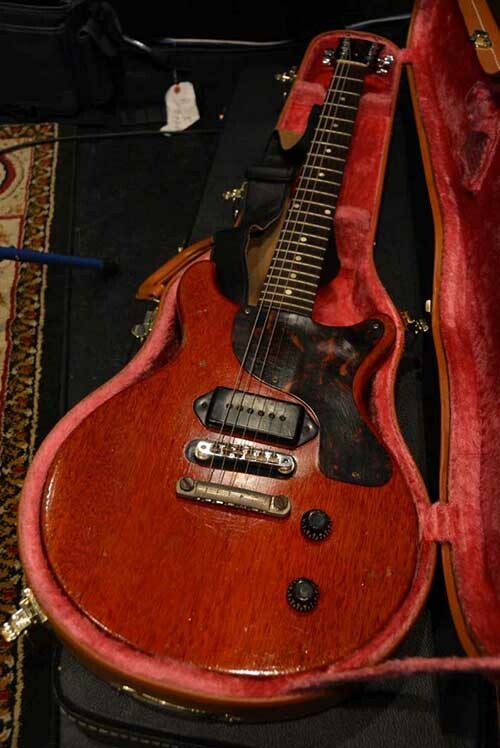 GIBSON 1959 Les Paul Junior Cherry (DUANE), the first guitar that Duane Allman had his mom buy for him. 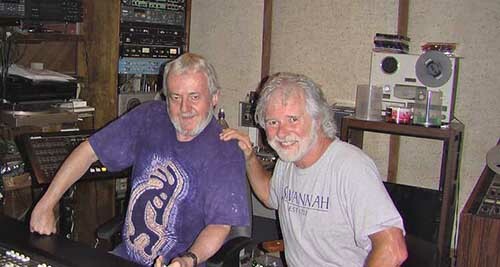 Delaney Bramlett had owned it for years until Kishida obtained it in 1999. The combination of the mahogany body and its P-90 pickup is exquisite. Q: I remember you saying, when that Explorer first came to Japan, that the guitar's mid-range was unique. KK: Yes, when playing lead solos. That's precisely the "E.C. was here" sound. I've been focusing on vintage guitars since 1971, and I can say that that '58 Explorer that Clapton owned is totally different. There are things only that guitar has. It has a universe of its own. It doesn't let any other guitar get closer to it. I've experienced about five or six different Explorers in the past, and that one isn't like any of those. The greatness of it overwhelms the other guitars. And that's why I insisted on borrowing it this time. They made sure I only use it for one song though! GIBSON 1958 Explorer (Eric Clapton cut off), the famous guitar that Eric Clapton obtained in 1974 during his come-back tour. It was used when he came to Japan the same year, and was later given to Junior Murvin who was the guitarist for Bob Marley & The Wailers. 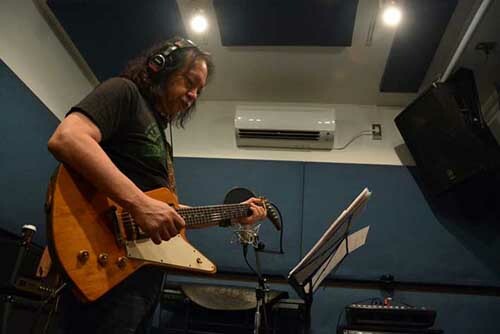 The guitar was borrowed this time from the current owner to be used on the album by Kishida who claims that it is beyond all guitars regardless of category. Q: On which songs was the other Explorer used? KK: The rhythm guitar on the third song "Livin’ in the Darkside City." The reason I used it for rhythm is because if you use the Telecaster on the lower range of the rhythms it sounds light even though it's thick. Meanwhile, Les Pauls would sound too heavy. And I thought, "Ah, the Explorer would be nice for rhythm guitar!" GIBSON 1958 Explorer, one of the only 22 that were made. The dirty low-down sound is unique to Korina. "Works great on low range rock'n'roll riffs," says Kishida. 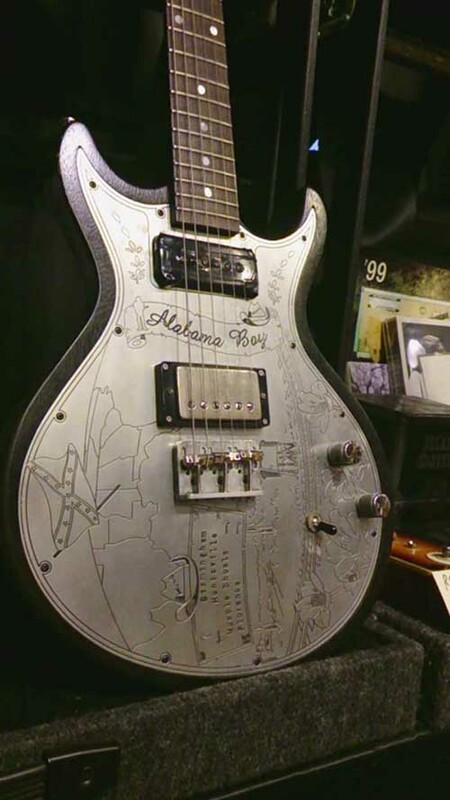 RS GUITAR WORKS 2012 ALABAMA BOY, Kishida's very own all-in-one type signature model that he custom ordered when he visited the company in Kentucky. The sound is exquisite especially when playing slides. This was the only non-Gibson guitar that was used in the album. Q: I like "Luv Bite" too, especially the way the intro starts with the organ and connects to the slide guitar. KK: "Luv bite" is what we Japanese call "ama-gami." It's my image of American love stories from the 50s. It's the image of something streaming along when you're dozing off in a seaside cottage in California. I made it in a very 50s-ish style. Q: The album starts to show a lot of variation from this point, which is the fourth song, doesn't it? KK: Yeah, I know. 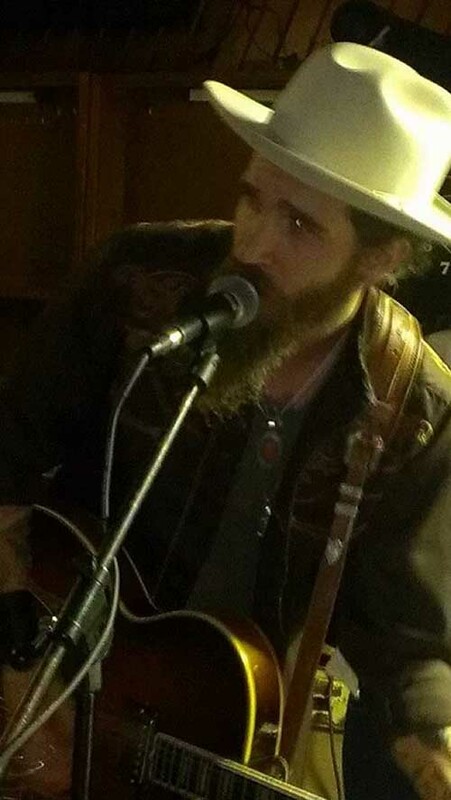 Johnny suggested that the first three songs should be catchy, since the listeners will keep focus up to that point. Chuck also said that "Luv Bite" is an interesting song. I just made it naturally, but I guess it's a type of a song that Americans might not typically think of. 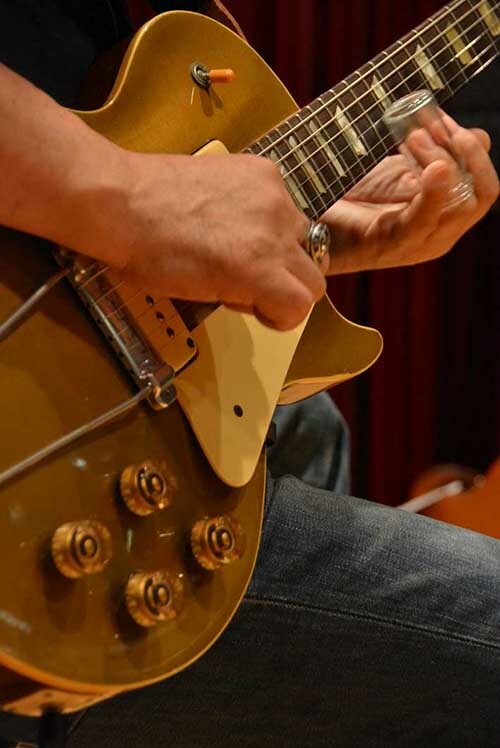 GIBSON 1952 Les Paul Gold Top/P-90, used in "Luv Bite." This model was made in the year that Les Pauls were first released, non-bound with P-90 pickups and a trapeze tailpiece. The unique tailpiece has been exchanged to Nancy's original bridge so that the guitar will maintain a stable tuning. Q: The sixth song of the album is the title song. KK: This is a really catchy song, and I did it thinking that Duane Allman might do something like this if he was still alive. It's that kind of a classic style of southern rock slide guitar. When Chuck heard this song he said that the melody line was interesting. Q: But your intention was "classic" American rock, wasn't it? KK: I know. [laughs] That "Da da ka da da" is something I thought we're all used to, but I guess Chuck thought that the way it's emphasized was interesting. Q: Who is Rocky in "Ballad of Rocky"? 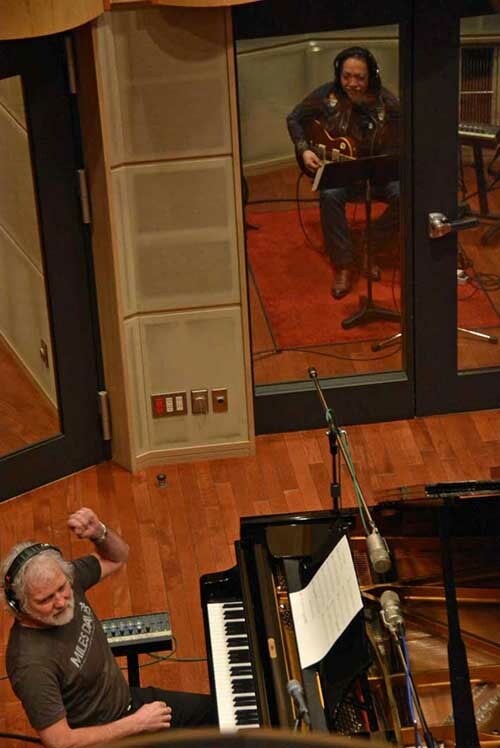 KK: When I released the album "Swamp Waters," a friend from my school days sent me an email and that snowballed into a gig in the city of Sendai. He had survived the Great Earthquake [that hit Sendai and the whole Tohoku region in 2011], but died of cancer two years ago. So this is a requiem in his memory. This isn't part of the nine songs I made with Chuck, but it was made last year. I also played it live in Sendai. Q: You seem to be making a lot of requiems lately. KK: Yeah, sad isn't it. GIBSON 1958 Les Paul Standard Gold Top, with the same PAF as the Burst. It may look like the original Gold Top in this photo but, just like George Harrison's Lucy, the top has been refinished to cherry red. Compared to the trebly Burst, this guitar has a warmer and an acoustic sound. ■ I feel that I'm finally “settled” in a sense. Q: Can you also talk about "Unfinished"? KK: This one's an epic! Since I knew Chuck was going to join us, I wanted to make a song in honor of the keyboards. And nothing can represent the keyboards better than Schubert, right? Q: What? Well, that's pretty much a big leap, isn't it? Yeah. There was an old movie about Schubert, as old as pre-WW2. I did some research later and found out that it was released only in Germany and Japan. And this song is called "Unfinished" as in "The Unfinished Symphony." The lyrics tell the story of the movie as it is. Schubert auditions to be hired by aristocrats, and as he plays the piano a high society girl laughs at one point which forces him to stop playing. But she asks them to hire Schubert. It's a kind of a love story between the two, although at the end, she gets engaged with a man of similar class, and Schubert plays music for the occasion. As a wedding gift he plays that same number, and this time the girl cries at the same point that she once laughed. That's the story of the movie. Now, about my version of "Unfinished." First of all, I played temporary solos for all five choruses of solos. And then I let Chuck listen to them and asked him to play those five choruses any way he wants. He thought about it and said, "I got it!" The result was the piano for the first chorus, the organ for the second, call-and-response between the Hammond for the third and so on. I had goose-bumps listening to him play! Everybody at the recording was overwhelmed. I mean, he played all five choruses alone, all the way through without a single mistake. He was like a Super Saiyan from "Dragon Ball"! So, next it was my turn to think about how I could close in on him. And I promised myself I'm never gonna chain all five choruses together when I play. Of course that was the same for my other songs too, but this particular song has Chuck's performance in it, right? So I had to be determined. I played that in July. Actually I had a wrist pain then, and so it wasn't like I could fail a bend and do it all over again from the beginning so easily, and that situation made me play guitar solos as intense as that. Q: I could see that you play the guitar with real attitude. 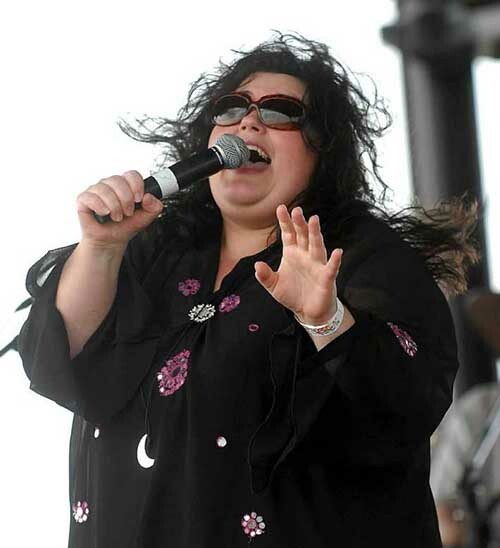 KK: You know, I always hope that especially the younger people would start feeling like doing cover versions of my songs, not only with this album but with all my albums. And regardless of their age, I hope that they would first listen to the album, and then play their guitars along with it. 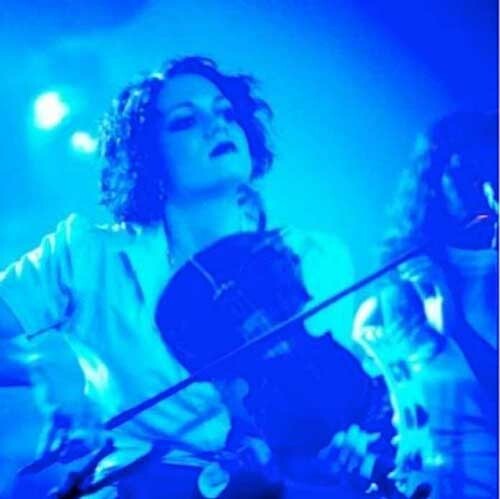 That's why I stopped doing tricky structures, and I also try to use chords that are easier to play like A, G and E.
Just like how I used to cover "Crossroads" and all those Cream songs, if people could see my album with the same feelings I used to have, that kind of goes full circle. It's like me carrying on the tradition to the youth. I want them to listen to this album and set a goal of getting as close as they can to it. I even wish there was a karaoke version of this album, like "Play the guitar solos on my behalf" kind of thing. I wanted the album to be something like that. Chuck also commented on that saying, "So, I played on your album against the guitars with keyboards like this, but other guitarists may listen to it and change it into something different." It's just like the song "Unfinished." Since it's unfinished the song ends abruptly, right? It means that we're not done yet, that we'll keep on evolving. I guess I can say that this song is the highlight of the album. Anyway, I don't think I've recently played as many solos as I did on this album. And after I completed it I didn't listen to it for nearly a year, so that it would still sound fresh to me at the time of its release. But ever since it was released in America in June, I've been listening to it every day and I feel that I'm finally “settled” in a sense. KK: That I've done the music I wanted to do with Les Pauls. I mean, I can't even tour without this whole line up. I've already done some of the songs live on stage, but I want the guys there if we're going to do a proper promotion gig. I'd really like to get together with them over there in September. The album has such a live feeling that it's worth it. Actually, I think it's an exclusive album, and I don't want it to sound too difficult either. ■ I want everybody to guess which guitars were used on what. I also want music store clerks to listen to this album. Q: Are there any other songs you'd like to mention? KK: For this album, I was making songs every day using the Boss BR-600 (digital recorder). I'd make one song, and the next day I'll forget about that song so that I could make a totally different type of song. That's why it turned out to be an album with variety. So I think that, to me, all songs are worth mentioning. But if I'd choose one, I guess it would be "I WA KI." The title is separated into three words, but it's really about Iwaki City in Fukushima Prefecture. The city of Iwaki has issues such as the nuclear power, you know? We shouldn't forget about those power plants. The Japanese version of my new album comes with liner notes, translation of the lyrics, and a detailed list that tells you about which guitars were used on which songs. But I want everybody to guess which guitars were used on what. I also want music store clerks to listen to this album. I want them to focus on the beauty of the sound of vintage guitars and things like that. When I used to work for a major music store, we got to try out '59 Les Pauls at the store even though we didn't own any. But I don't think you get to do that anymore, and it's a pity since there's a lot we can learn from vintage guitars. For example, you can discover the way it sounds without effects and so on......I hope that the younger generation can learn those things by listening to this album. I want them to listen to it in that kind of way. Copyright © 2014 kunio kishida All Rights Reserved.